Did you know that tuna and peaches go well together?? I didn’t, until yesterday. I like to eat my lunch with fruits so even with small portions, I feel full. I was having tuna salad and I just grabbed one of my daughter’s snacks… a cup of diced peaches (no sugar added). I was surprised!! The taste and texture were amazing. In a bowl, combine the tuna with the mayonnaise, lemon pepper seasoning, chives and salt. Set aside. Taste for seasoning and add more if you like. Pit and dice the peaches with or without skin. Personally, I like peaches with skin on. Place half of a diced peach in each of 2 small glasses. Top with half of the tuna mixture. Finish with the rest of peaches into both glasses. Sprinkle with some chives and chill until serving time. Very different! I would have never thought to combine the two flavors, but it makes sense. I like grapes in my tuna salad, so why not peaches? I also wanted to let you know that I nominated you for an award (visit my site for more info, lauriescravings.blogspot.com) Congrats! 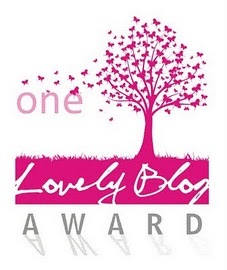 Thanks Laurie for passing on the "One Lovely Blog Award" to me.It feels great! !